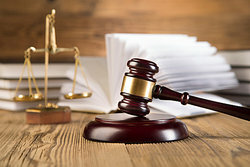 The term judicial powers refers to the power of the Judicial Branch of the United States government to hear cases and interpret, enforce or nullify laws and statutes in order to render verdicts. Original Jurisdiction: This is when a court is first hearing a case. This court is then said to have original jurisdiction. Appellate Jurisdiction: This is when a case has been appealed (the original decision questioned) and another court hears the case. Redress: This term refers to dealing with damages and relief. Diversity Jurisdiction: The ability of federal courts to hear cases involving people from different states. Subject Matter Jurisdiction: Federal courts have jurisdiction of cases involving federal law. Precedent: Precedent is based on findings and law from prior cases. Lower courts must follow precedent set by higher courts. For example, if the U.S. Supreme Court says that the constitution protects abortion in Roe v. Wade, all lower courts must abide by that ruling. Stare Decisis: This means "Stand on the Decision." This refers to the concept that courts should rely on precedent rather than changing law. Courts are allowed to exercise judicial power in order to change or nullify laws that are not in line with others (such as state laws vs. federal laws or international laws) or if laws are not in line with the constitution. The Supreme Court is always considered the highest court in the United States of America. It is up to the Supreme Court to be able to sufficiently and effectively interpret constitutional law in the United States. A judge hears an insurance fraud case. Based on precedent determined in a previous case in another court, the judge finds the defendant guilty. A homicide case is in court. It is the first time it is being heard, so the judge has original jurisdiction over the case and sentencing. A robbery case is being heard in an appellate court. The judge has the power to review previous information about the case from original jurisdiction. A drunk driver receives a specific sentence as a result of precedent. A case involving damages of $75,000 is heard by a federal court as a result of diversity jurisdiction. A judge decides that the consequences for manslaughter are too penal in a given case, and changes the precedent by lowering the minimum sentence. A judge determines that a precedent law is unconstitutional and finds a defendant not guilty as a result. A judge rules in such a way that is not in line with precedent regarding state gun laws, thereby changing precedent. A judge rules in favor of a defendant despite the indisputable drug charges against him based on the intent to change drug regulations. A judge delivers an extremely harsh sentence beyond the typical range to a defendant found guilty of assault in order to send a message to others and attempts to increase jail time to bring about change in the district. A judge overturns another judge's decision in appellate court. The federal government chooses to take jurisdiction over a state case because it involves federal law. The federal government chooses not to hear a case by those from different states because it is a case under $50,000. The Supreme Court has the greatest power because it is not bound by any higher court's precedent. While the Supreme Court of the U.S. should, and does, respect decisions made by prior cases they have heard, the Supreme Court can change precedent within the bounds of the Constitution. "Examples of Judicial Powers." YourDictionary, n.d. Web. 23 April 2019. <https://examples.yourdictionary.com/examples-of-judicial-powers.html>.